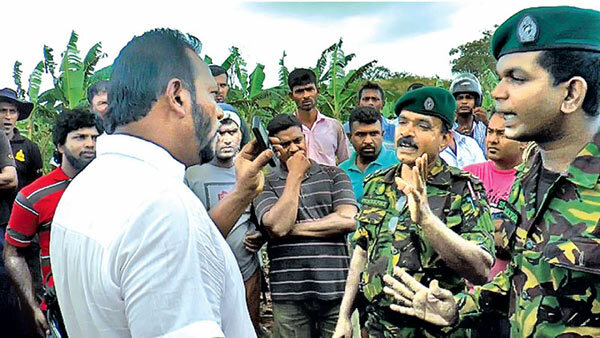 An argument erupted between Wildlife Deputy Minister Palitha Thewarapperuma and Police Special Task Force officials at Suriyawewa after tipper drivers complained to the Deputy Minister that STF personnel in civvies are in the habit of confiscating their mobile phones. The tipper drivers carrying earth to Southern Expressway construction sites complained that STF personnel in civvies are in the habit of abusing them verbally, stopping their vehicles and keeping their mobile phones with them. They made this complaint to the Deputy Minister when the latter visited several Grama Niladhari divisions in the Suriyawewa DS division where wild elephants had started raiding villages destroying their cultivations in the night. Thewarapperuma told the STF officials that they should take legal action against the tipper drivers if they indulge in illegal activities but abusing them verbally and keeping their phones with the STF personnel cannot be condoned. At this instance, officials of STF camp at Suriyawewa had arrived at the scene where an argument with the Deputy Minister ensued. STF officials justified their actions in controlling illegal activities of tipper drivers. The Deputy Minister said that he would inform the situation to the higher ups in the police department.